Friday: Farewell to Cath and Stewie. Again. Saturday: Quite a productive morning. Doctor mid morning. Late brunch at Gus' Place with the sweetie. Photo processing all afternoon. Cleaned my computer desktop. Cooked a whole heap of Kit's tomatos for dinner with some gluten free pasta (she had a whole freezer drawer full of them which she gave to us before they moved). I liked it but the sweetie thought it was too fiddly picking out stalks of thyme and tomato skins (you can eat tomato skins you know! ;) ). Watched Discovery and Dunkirk. Monday: Posted my Canberra 1986-2016 blog to the Canberra Reddit. At least a few hundred people had a look which was pretty cool. Although Reddit's UI is pitiful. For posting there was a link tab, an image tab and a description tab. I filled out all three, but only the link ever posted. So stoopid, Reddit!! Yet another storm rolled over in the evening. This one was pretty close so turned off my computer. Which was annoying because almost everything on my todo list involved the computer! Smashed out a 192 piece jigsaw while I waited. Tuesday: Began processing Stu's photos. Android (at least the last two Stu's had) has a SUPER annoying bug where the forward facing camera has no date taken exif data saved. Which makes it annoying to geotag, because apps rely on that field. Some photos I manually geotagged, others I forced exif data into them based on the date modified field (with GeoSetter itself) so could auto geotag them. Very very annoying. Especially when like half of all Stu's photos on the holiday were selfies! Thursday: Realised it's been five years since: a) Dad went and carked it, b) we first attempted to watch MacGyver on DVD (only got half a dozen episodes in), c) Fiona was here with Bruce. Friday: Drove to Sydney. Will save that for a separate post. This week I've been trying to catch up on All The Things. Starting with all my iPhone photos and screenshots from when I first got the phone in November. Photos are easy to work with now that I can use Faststone to force the date modified field to be the exif date taken field, so that fixes up all the photos. For the PNGs (screenshots) and other miscellaneous files (movies and portrait edit information files) I got an app - BulkFileChanger - which is a nifty tool to modify the date modified field. You can offset by x minutes/hours, which was super useful for fixing up photos from different time zones for the trip, or you can manually set to a specific time. So I have to look while the phone is plugged into the computer what the actual date should be, then fix it with this app. A fair amount of work, but gets the job done. Although the last time I downloaded all the files none of the new ones were wrong. Maybe 12.1.2 fixed it???? Last night while trying to backup, the computer had a sad and I ended up rebooting it. But did you know you can only reopen closed tabs ONCE when you quit Chrome? I quit it twice and lost all the tab history. That was pretty annoying. I had closed and saved a lot already, and history got most of the rest back. 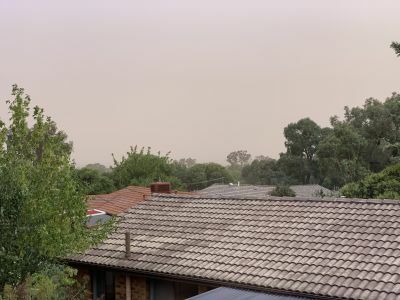 But who knows what I'm missing..
Tuesday afternoon we also got a dust storm that obliterated Mt Ainslie..
Organising all those thousands of photos certainly keeps you busy!